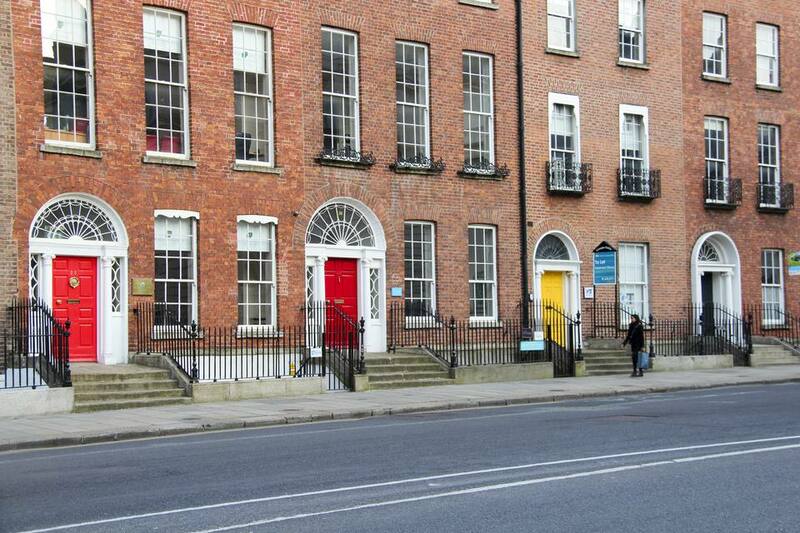 You will have heard about those famous "Doors of Dublin." Even if you have not, as soon as you open any well-illustrated travel guide, you will have seen one or two. And as soon as you are in Dublin, you will spot them everywhere. Literally. You won't just see the actual doors, but also as postcards, posters, t-shirt prints, fridge magnets, and souvenirs. The latter, thankfully, in miniature form. It would be hard to fit a door into your luggage, never mind the excess weight fees! But what actually is the story behind this? How did the "Doors of Dublin" become such an iconic image of Ireland's capital? Well, it was by accident. And the story really started ... in New York. It could be a story straight out of "Mad Men." Around 1970, a man called Bob Fearon, then working in an advertising agency based in New York City, traveled to Dublin for a commercial photo assignment. And, walking back to his hotel, something caught his eye. You see, his way led him first through Merrion Square, then through Fitzwilliam Square. Both (even today) essential parts of what is called "Georgian Dublin." And Don, wait, sorry, Bob Fearon, was immediately taken in by the rigid symmetry and elegant beauty of the many Georgian doorways he passed. In fact, these were too good to pass by. Bob Fearon took photos, without any commission, just out of interest. According to later reports, he snapped between forty and fifty of Dublin's Georgian doors. And later began to toy with the idea of arranging these images in a collage, creating an artwork, as a souvenir for himself. Bob Fearon went ahead with his plan, and the stark-yet-pleasant doors he had photographed in Dublin lent themselves to a collage like nothing else. Because of their very symmetry and similarity, fitting three dozen doors (all different, yet all essentially the same) into a grid was a piece of cake. Fearon was pleased. So pleased, in fact, that sometime before Saint Patrick's Day, always a big thing in NYC, he contacted the Irish Tourism offices on Fifth Avenue. There he ran into Joe Malone, North American manager of Bord Fáilte. And once Malone had seen Fearon's collage, he was hooked. This would be the perfect display in the main window, especially for this season. The collage went up on 5th Ave, on the eve of St. Paddy's ... and even New Yorkers stopped to look, with some going even further, entering the offices, and asking whether they could buy a copy. So, could they? Not at first, but Joe Malone contacted his colleagues in Dublin, and the Irish Tourist Board thought that they might be onto a winner. They, in turn, contacted Bob Fearon and bought the rights to images and the collage, to which Fearon added the alliterative title of "The Doors of Dublin" (which used a sort-of-Irish typeface). The end result? A poster which became an icon in itself, by portraying iconic Dublin house entrances never properly noticed before. And which sold like the proverbial hotcakes. Alas, as ever, you can copyright an image, but you cannot copyright an idea - and the concept of snapping a few doors, then arranging them as a collage, is not really so unique. This meant that, sooner rather than later, intrepid entrepreneurs decided to make their own version of the famous "Doors of Dublin" poster. Completely legal. Should You Search for an Original? No, you should not ... because, to be very honest (and with apologies to Bob Fearon), the original poster is a bit dated. And not only because it has been around a few dozen years now. The fact is: since Fearon's day in Dublin, Dublin has changed. And so have the doors of Dublin. They are still there, but many have very much improved over time with decent paint jobs, sometimes exciting colors, some becoming artworks in themselves. And the buildings they lead into have often been cleaned up, renovated, subtly changed their appearance for the better. So many of the more modern imitations of the original poster are simply brighter and more colorful. On the other hand, just because there is a "New Beetle", the venerable Volkswagen Käfer (that's the Beetle when he's at home in Germany) is still unbeatable. And the original poster of Dublin's doors has a certain retro appeal, even though times have changed. So, if you are a collector and have a longing for the "rare auld times" (as the song goes), by all means, search for an original or a reprint. But if you just want to send a postcard home - grab the one you like best. The folks will never notice! Indeed, why not? In these digital days, you may snap away to your heart's content for a few Cents. And it won't be hard to recreate the classic in a grid, laid out in GIMP or Photoshop. But where will you find those doors? Well, in Georgian Dublin, of course! Many people assume that they are confined to Dublin's Southside. And indeed, a stroll around Merrion Square, Fitzwilliam Square, and the surrounding areas will lead you past a hundred and more of Georgian houses with the archetypal "Doors of Dublin" out front. Some in better shape than others, some in muted colors, others "in yer face". Some more or less plain and original, others sporting half a dozen letterboxes, doorbells, and alarm systems. You take your pick. But also venture further afield. On the Northside, for instance, many a street still has Georgian houses, complete with these doors, and they are less often photographed than their southern counterparts. There is one even almost overgrown with wisteria, a stunning sight when in bloom, and just around five minutes walk from the Garden of Remembrance.